Versa Products is a Los Angeles based manufacturer of modern, high-quality furniture. 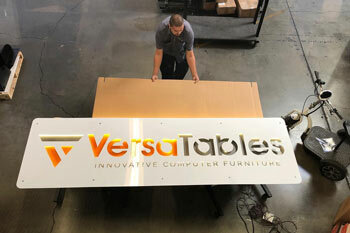 With 140 employees, a 95,000 sq ft facility, and 115 years of industry experience, the Versa team brings a creative and personalized approach to developing home and office furnishings specialized for their clients. We recently had the chance to speak with Nathan Endow, IT Director at Versa, to hear what he had to say about their experience since switching to Telzio. They had previously used ShoreTel and TelePacific. Q: What's your role at Versa? I'm the IT Director at Versa Products. I'm responsible for deployment and management of all our technology and communications platforms. Q: What were the biggest challenges with your phone system before implementing Telzio? Our prior VoIP system was challenging and inefficient. The system itself was awkward and confusing to manage. The phones were counterintuitive and could only be programmed by a ShoreTel technician. On top of that was the cost - our monthly service was $1,900 per month (52% more than what we pay with Telzio now), plus the $24,000 setup fee we paid for phones and installation (there was no setup fee with Telzio). Q: Who uses Telzio at your organization? Our entire company of 140 employees uses Telzio. This includes every department from sales, marketing, accounting, administration, and engineering. We also have Telzio intercom and cordless phones in place throughout our 95,000 square foot factory. Q: How do you use Telzio for your organization? We have Telzio set up to integrate with our CRM platform to streamline processes for both our sales and customer service teams. We use toll-free numbers for our inbound customer service calls and use local numbers for our outbound sales and daily operations. We love the ease-of-use and automation that Telzio provides us, including call routing features like phone menus, queues, and schedule-based routing. Q: How has Telzio helped your organization? It has been incredibly helpful to integrate our phone calls with Zendesk, our customer service platform. We‘re now able to better track our customer’s buying experiences and optimize our customer service processes. Our internal communications are now much more efficient and Telzio’s user-friendly interface is much easier to use and manage as needed. Whereas before it was necessary to contact a ShoreTel technician for any little change, I can now manage everything right through my browser, and it goes live instantly. Q: How can Telzio improve? The product and customer service is all great - we give Telzio five stars. Want to see if Telzio is right for your business? Sign up for a Free Trial or Contact us for a demo.